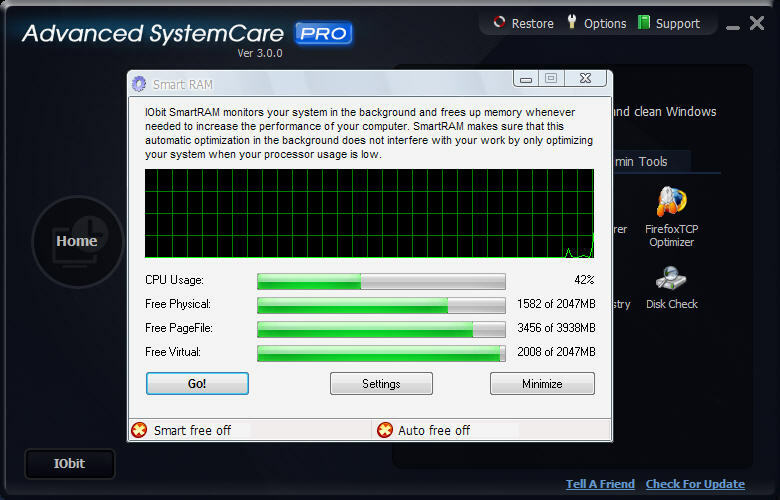 Advanced SystemCare PRO protect and speed up your computer with Advanced SystemCare PRO. It provides an always-on, automated, all-in-one PC Healthcare Service with anti-spyware, privacy protection, performance tune-ups, and system cleaning capabilities. Advanced SystemCare PRO fixes stubborn errors, cleans out clutter, optimizes internet and download speeds, ensures personal security and maintains maximum computer performance automatically. ...... and maintains maximum computer performance automatically. Advanced SystemCare PRO Edition is a comprehensive security and performance solution that takes care of it all. Advanced SystemCare PRO provides total maintenance for everything I need to do on my PC and online in a 'one-stop-shop' solution. * Ultimate Speeding Up with Turbo Boost - speed up your PC by shutting down unnecessary background processes, cleaning RAM, and intensifying processor performance. * Enjoy That New PC Feeling Again - enjoy that 'good as new' speed usually only experienced on a brand new PC. * Next-generation Registry Deep Clean and Optimization - Finds and fixes the registry errors that other utilities miss with "Deep Scan" technology. Qweas is providing links to Advanced SystemCare PRO Edition 5.4.0 as a courtesy, and makes no representations regarding Advanced SystemCare PRO Edition or any other applications or any information related thereto. Any questions, complaints or claims regarding this application Advanced SystemCare PRO Edition 5.4.0 must be directed to the appropriate software vendor. You may click the publisher link of Advanced SystemCare PRO Edition on the top of this page to get more details about the vendor.